Miraculously, something has appeared from the shambolic mess arrangement, I am claiming is my sewing space. This is a bag I have made as a gift. It is a boxy shopping tote, made from a pattern that I ripped-off drafted from a cheapy supermarket bag last year. 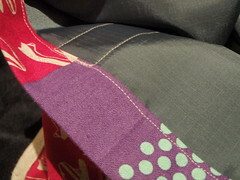 The outer is Echino's decorator fabric, Plane Squares. Its a lovely vibrant print on a agreeably heavy-weight cotton: quite delightful to sew with. The lining is a durable, water-resistant rip-stop nylon in Charcoal. All the seams are sewn to the outside, then bound, to give the inside of the bag a nice finish. I made the binding from the most beautiful piece of pure linen. Being that my real name is Hoppo Scrooge Bumpo, I purchased just 30cm of the fine (read: expensive) fabric and made straight, rather than bias cut binding. 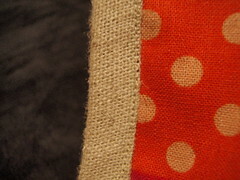 I have never worked with linen before so I had no idea that it frays if you so much as look at it sideways. I have to say that the the air was blue with profanities as I contended with sewing straight edge binding (that was unravelling) round sweeping curves and through 57843 thicknesses of fabric. It was ugly - very ugly - there for a while. Not as ugly as the sewing space though. Best be off to do a clean up. All that swearing and fraying was most definitely worth it. You'd better get some nice compliments from the checkout chicks the next time you go shopping! Well, gorgeous shopping tote despite (or perhaps because of?) the swearing. Love the Echino fabric and the linen. Fab bag! Good always comes from perserverance and a little swearing doesn't hurt! Very cool! Great work, The texture of linen binding with that fabric looks awesome..
That's a cool bag - knocks those green bags for six. My shower cap arrived today! thank you! It is SOOO gorgeous and such fabulous quality! I love it thank you Liesl and the buttons are sweet as and a nice surprise!!! I am Loving your shopping tote too! That is just a very beautiful bag! Nothing else to say. Seriously gorgeous - love that echino fabric, looks so great Mrs HB! You've done it again. My word verification is spent. Is there something you need to tell us about some money you spent? Or are you spent after finishing this beauty? It's so damn fabulous, and I'm sure well worth the agony. Sometimes the good things only come in swearing blue profanity colourways -- looks like you came out the other side of the blue into ... oh, the metaphor breaks down... It's colourful and just perfect! Looks brilliant - gorgeous fabrics. What a great bag - the fabric was perfect! Love the use of linen. Have a great weekend. Hey, looks like it turned out damn fine! That looks so much nicer than my green bags! It's so cool. I need to make one of those. I fear from your description that I don't have it in me!!! Great job. I LOVE that fabric....although come to think of it I love nearly all the echino fabrics. I like the practical bag lining...well thought of. I'm so behind on reading blogs so I'm tucking in for a good chuckle as meander back through time on your blog, hoping to learn a bit about seams as well! how i relate to this!!! really well finished, i esp like that you thought of the inside!!! What a great bag.... it looks amazing ! !